Gonaives, Haiti - U.S. Navy Seabees, Soldiers and Marines deployed to Haiti as part of Exercise New Horizons. 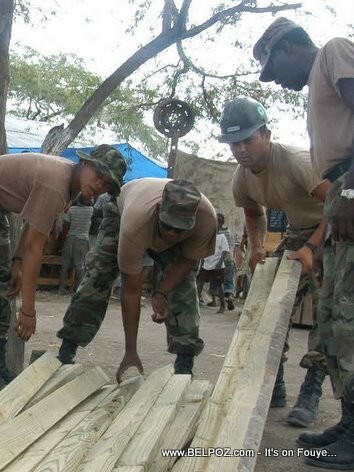 Members of Task Force New Horizons select wood beams to build decks for four tents in Gonaives, Haiti. A U.S. joint task force is deployed to Haiti conducting this humanitarian and civic assistance exercise sponsored by U.S. Southern Command. New Horizons Haiti provides U.S. medical and engineering units a great opportunity to refine skills while assisting the Interim Government of Haiti.